Studies have shown that as many as 70% people who get a windfall lose it within a few years. It is, therefore, important to create a regular income stream. Sanjay Kumar, 50, had no clarity on what he should do when his company offered him retirement. The company was incurring losses and was on budgetary support for the last many years. "Given the unstable condition of the company I decided to opt for the voluntary retirement scheme (VRS)." However, he was fearful that the money he would get would not last for life. He was also not sure if he would be able to find another job. He decided to consult his financial planner. "The planner advised me to create an income stream," he says. There are many people like Sanjay who have to make the difficult choice between continuing with their jobs and walking away with VRS money. Suresh Sadagopan, founder of Ladder7, a financial planning and advisory firm, says, "VRS is a good option if one is in a position to get employed or the company gives full pay for the remaining service. If it is not lucrative, one can continue, but it may be that later one is eased out of service on one pretext or the other." Several private and public sector companies have come out with VRS of late. For example, thousands of employees at Nokia's plant in Sriperumbudur recently opted for VRS. The fallout was that Foxconn, which was supplying more than 70% parts to Nokia, also suspended production at its Chennai factory and offered VRS to employees. The Ministry of Heavy Industries and Public Enterprises has also said that the government is in the process of winding up at least seven loss-making public sector companies. You must be cautious with the money you get because studies have shown that as many as 70% people who get a windfall lose it within a few years. It is, therefore, important to create a regular income stream. Here are a few tips on how to go about it. One should determine asset allocation on the basis of one's goals and risk profile. Lovaii Navlakhi, founder and CEO, International Money Matters, a Bengalurubased financial planning and advisory firm, says, "There can be an inclination to splurge and improve lifestyle without considering the future. This must be avoided." One important point is that the person may not be near the superannuation age and so the number of years for which he needs to plan can be three or more decades. Hence, he must invest some money, say 40-45%, in equities or equity-related assets, and the rest in instruments that give regular income. Sadagopan of Ladder7 says, "If they are going to get a job, they will not need the funds. So, they can invest in a manner that the corpus grows." "If a person is in the higher tax bracket (taxable income is above Rs 5 lakh), he can look at options such as arbitrage funds. But if the annual taxable income is less than Rs 5 lakh, he can look at options such as post office monthly income schemes and bank fixed deposits," says Harsh Roongta, director, apnapaisa.com. Interest from the latter two schemes is added to the income and taxed according to the person's tax slab. The former are more tax efficient, as we explain in the following paragraphs. Here are a few products you can invest in for periodic payments. Monthly Income Plans (MIP): MIPs are ideal for those who wish to invest in debt but also want small exposure to equities. 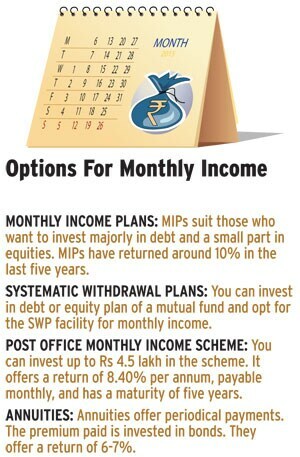 MIPs offer monthly income by investing around 80% money in debt and 20% in equities. The dividend is tax-free in the hands of tax payers. MIPs have returned 10% a year in the last five years. Tax rules are the same as for debt mutual funds. Short-term gains are added to the income and taxed according to the person's tax slab while long-term capital gains are taxed at 20% with indexation. Systematic Withdrawal Plans (SWPs): You can invest in debt or equity plan of a mutual fund and opt for the SWP facility. In SWP you decide both the quantum and frequency of payments. Post Office Monthly Income Scheme: You can invest up to Rs 4.5 lakh and in case of joint account up to Rs 9 lakh in this scheme. It offers a return of 8.40% per annum, payable monthly. The maturity period is five years. Annuities: Annuities protect customers from outliving savings by giving guaranteed income. The premium is invested in bonds. Interest rates are as per the yield curve when the annuity is priced. The returns are usually 6-7%. But remember that annuity income is taxable. Many people start their own business from VRS money. This could be dangerous. If you want to do this, go for a business that does not require much capital. Many people also invest VRS money in real estate, forgetting that it eats into future income if one has taken a loan also. "Real estate sector has lots of uncertainties. Also, rental returns from residential properties are around 2% at the net level. For commercial properties, the figure is 4-6%. Also,there are periods when the property is not on rent. Hence, this option can be given the go by," says Sadagopan. Then there are people who get attracted to schemes that promise super returns. This must be avoided at all cost.